The Padres are reportedly trying to trade for a starting pitcher. Could the #Nats engage with the Padres? 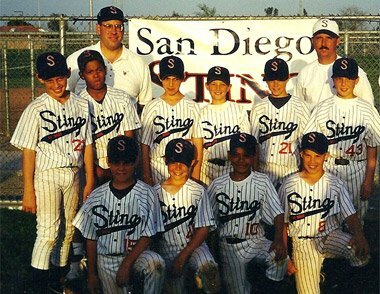 Stephen Strasburg (top left) led the San Diego Sting into the 11-under nationals in 1999. From The Athletic’s Ken Rosenthal, he reports that the Padres remain interested in a trade for Noah Syndergaard. Would the Padres have interest in trading for San Diego’s Stephen Strasburg? For those who did not know, Strasburg was born in San Diego in 1988 and grew up in San Diego and went to San Diego State while playing at State for Tony Gwynn. The Nationals have a $25 million tax number on Strasburg while owing him a large cash salary in 2019 of $38.33 million. Could the Nationals snag Francisco Mejia and another top prospect for Stras? The Nationals probably would not think of trading Strasburg who holds an opt-out after the 2019 season, but what if Strasburg was open to the idea of pitching in his hometown? If the Nationals traded Strasburg, they could have another $25 million of “tax threshold” money to spend in free agency for another elite starter behind Max Scherzer. Maybe they could put together a rotation of Scherzer, Patrick Corbin, Dallas Keuchel, Tanner Roark, 5th starter or Nathan Eovaldi in the #3 spot and get another pitcher for the #4 spot to push Roark to the #5. This is a far-fetched idea, but we now know the Padres are in the market for a top starter. The Nationals are also in the market for starting pitching. If general manager Mike Rizzo can sign some top free agent pitchers (plural), he can feel more comfortable getting creative. This entry was posted in Feature, Strasburg. Bookmark the permalink.